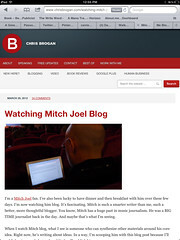 Last week, Chris Brogan posted a great blog, "Watching Mitch Joel Blog." Being a Brogan fan and subscriber for many years, of course I'm always interested in who he admires. The genius of Brogan's blog is to a great degree that he wrote it at all. Many of us watch what our social media peers are doing on Twitter, Facebook, Pinterest, and others, but the idea of watching a great blogger, like a great painter or dancer, is truly innovative. You should be exactly like Mitch. Yes. Research and find the exact right sentence for what you intend to say. Write with some meat. Put out a post that will really be resilent. You should be exactly like me. Yes. Write down an observation. Think about how this might be useful to someone else. Write with a little meat and a lot of “relativity fiber.” Put out a post that will be retweeted whether or not it’s any good. In this week's Watching Me Blog, Joel goes into great detail on his process, including his "preshow" (before the blog), the actual writing, and after the post. Surprises for me included his use of Windows Live Writer and Moveable Type, as opposed to Wordpress, which seems to be what most of the blogging world uses and what I had planned on transitioning into in the coming months. Food for thought. 1,000 words of good to great writing in an hour is also admirable, to say the least. Who wouldn't want to be that prolific? 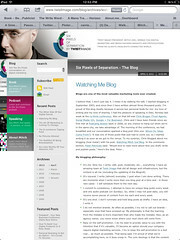 Interesting also that Joel prefers no music while writing, and even with all the Cloud programs out there, he prefers to email himself ideas as they come. He reads all his comments, but doesn't necessarily answer them all. Understandable, although not great from the "social" media standpoint, but that's something I find common with popular bloggers. All this reflection has me thinking about my process. I've had my blog for 7 years, 3 years less then the time I've been married, and 3 years more then the time I've lived in California. I've blogged on a Macbook that lasted 5 years before the graphics card failed last year (apple, I still thank you for 6 good years), and now on the iPad 2 using Blogsy, which I am on now, and Blogpress. Interestingly, my video tutorials on using these platforms have earned me the most comments of any other posts I've done, which tells me a lot about the power of "How To's," and the trends of the future. What will we be blogging on 10 years from now? Our cameras? Our watches? The dashboards of our cars? I don't concern myself too much with a set blogging schedule, but I have blogged as often as 3x a week, and as rarely as once in 2 weeks. I think it's better to write when you have something to say, and your fans and subscribers will stick with you. One of my favorite things about blogging is that it connects me to myself and to my community, and heightens my awareness of people and issues I might not have even realized. One of my least favorite things is feeling pressure to write, or that I need to get a certain amount of traffic in order to feel validated. I think Seth Godin said to write for yourself, and don't worry about your audience. OK then. Idea-wise, if I have my iPad on me, I use the notes feature to organize ideas and email them to myself. I also keep a notebook handy for ideas I get on the run, and I also get inspiration from tweets, news stories, articles, and dialogue from others. I do follow how big corporations like FedEx and airlines like Virgin America, Jet Blue, and United handle their community engagement and PR issues. I'm fascinated by how a company image can appear one way on a given day, and completely different within a matter of hours. Some of my goals for the near future are to reach out to more bloggers, comment more on those I follow so they know, and switch platforms to something with better SEO architecture. While Blogger has been a good basic platform, I'm ready to move on. In terms of content, I have enjoyed giving my spin on social media trends and tools, but feel I could be more authentic in some of my blog topics. I'm not the kind of blogger to bare my soul, nor do I feel that it's essential. But just as I want to know what makes you, the reader, different and real, so do I want to convey that as well. As for Chris and Mitch, you guys rock, not only for your talent, but because you do the hard work, with style. And by the way, Mitch, you had me at infovore. I'm adding that to my lexicon. Information vs. knowledge? Who wouldn't want to blog on that? I'd like to hear from you in the comments. What bloggers do you admire and why? What changes are you planning for your blog?